IT’S BEEN 10 LONG YEARS, as you know. And yes, we’re still celebrating our anniversary… IN EUROPE. On July 8—which also happens to be the first night of Berlin Fashion Week and BRIGHT Tradeshow—we’re reeling in our 10th with a rager at Prince Charles nightclub in Berlin. 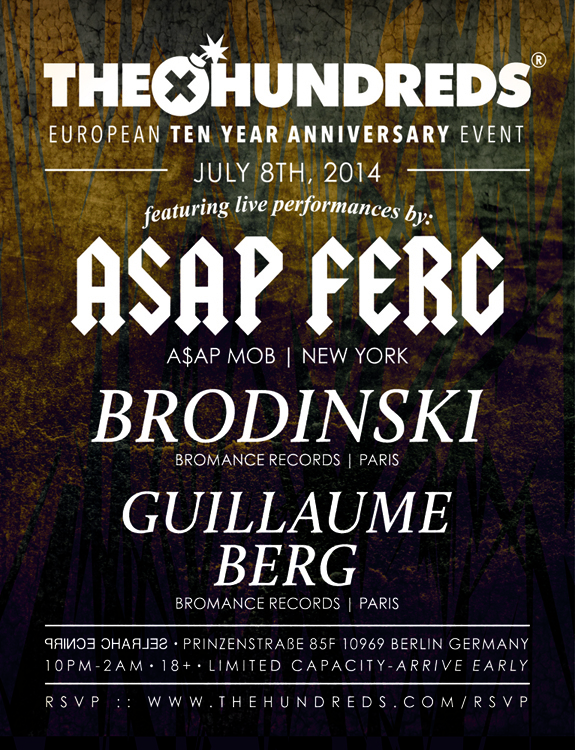 Featuring live performances from Harlem native A$AP FERG and Bromance’s finest Parisians Brodinski and Guillaume Berg, we’ve actually been wanting to throw a party with Bromance for ages, so we’re incredibly excited to finally make it happen. RSVP at TheHundreds.com/RSVP and get there early(!) today as it’s limited capacity. See flyer below for more details. Let’s rage.